Come experience our vibrant community at Lourdes High School! Come experience a day as a Lourdes High School Eagle by participating in a Shadow Day! 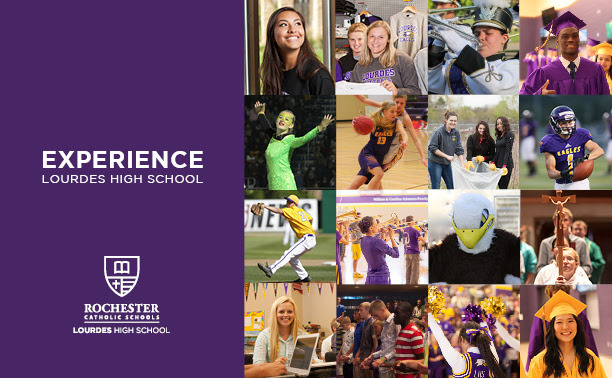 A personally selected student will show you our beautiful campus, introduce you to teachers and future classmates, learn about our athletics, fine arts, and extracurricular activities, and discuss the benefits of an LHS education while enjoying lunch with the LHS community. Shadow days begin at 7:30 a.m. and will end at 2:40 p.m. Visiting students may feel comfortable in adherence to the Lourdes High School Dress Code. Online registration is closed. If you have questions regarding the Shadow Day on March 1, please call Lourdes High School at (507) 289-3991. Are you considering the best fit for your child’s 9-12th grade education? We invite you to attend our 8th grade family information night! Our Catholic school teaches values, character, relevant content, and creative collaboration all within a unified community. You’ll learn about our incredible teachers, students, affordability, and culture. At this event you will have the opportunity to meet our staff, tour our school, and learn more about the 8th Grade Loyalty Grant and other financial aid opportunities. If you have any additional questions about this evening please contact our Admissions Coordinator at admissions@rcsmn.org or (507) 424-1817.